A few weeks ago, my friend Jen (from All Four Love Blog) and I headed south to Walt Disney World in Orlando, FL for Princess Half Marathon Weekend. 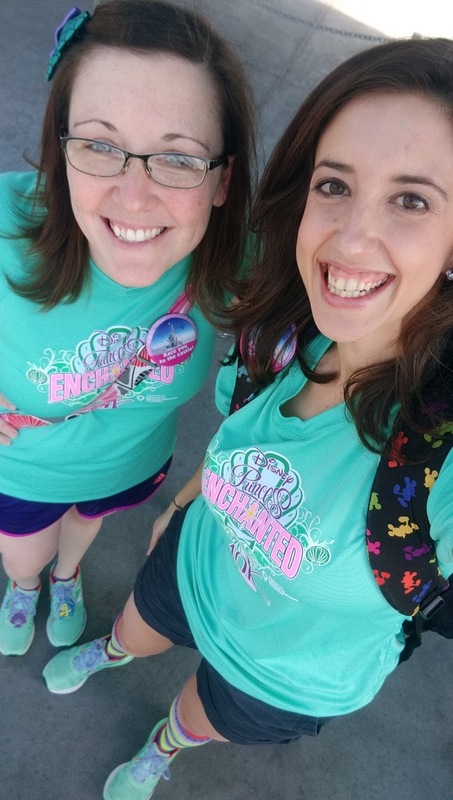 This was my first half four years ago and Jen's first runDisney event so it was bound to be special- and it definitely was! We flew into Orlando on Friday afternoon and went straight to our resort- Art of Animation (AoA). 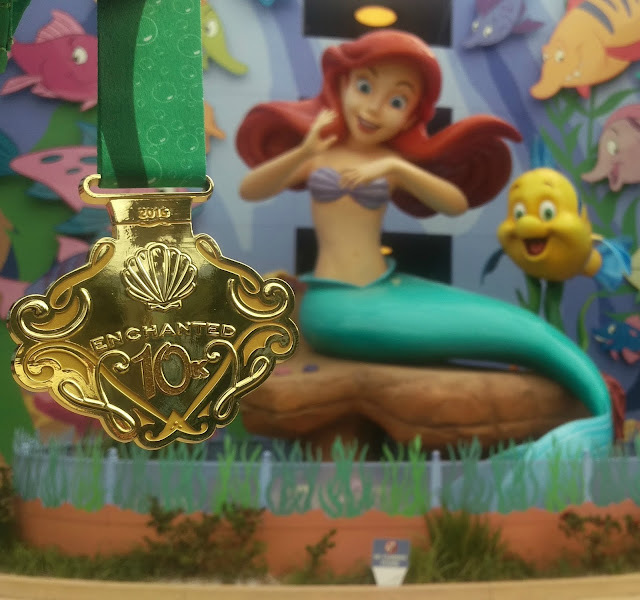 Both Jen and I are super fans of The Little Mermaid so staying in the Ariel section of AoA was a no-brainer! After a little mix-up with the type of room we wanted, we quickly settled into the room and then hopped on a bus to the expo. We got there around 4 pm and grabbed a few pictures then headed to pick up our bibs and race information- which was super easy. Then we walked over to the other building and got our beautiful race shirts! 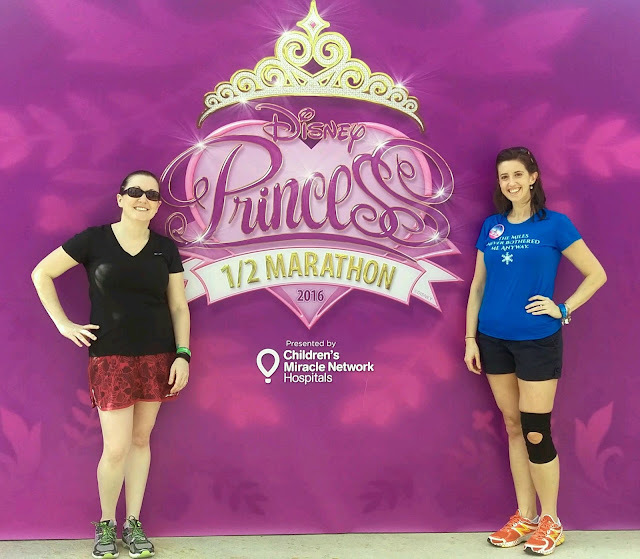 We were participating in the Glass Slipper Challenge so we got three shirts; a sea-foam/teal 10k shirt, a raspberry/fuchsia half marathon shirt, and a black glass slipper shirt. Ready for our Princess weekend! After getting our shirts we headed to the New Balance shoes area. We had forgotten to sign up for the virtual queue the night before but on a whim, we decided to see if they had any open slots. They did! 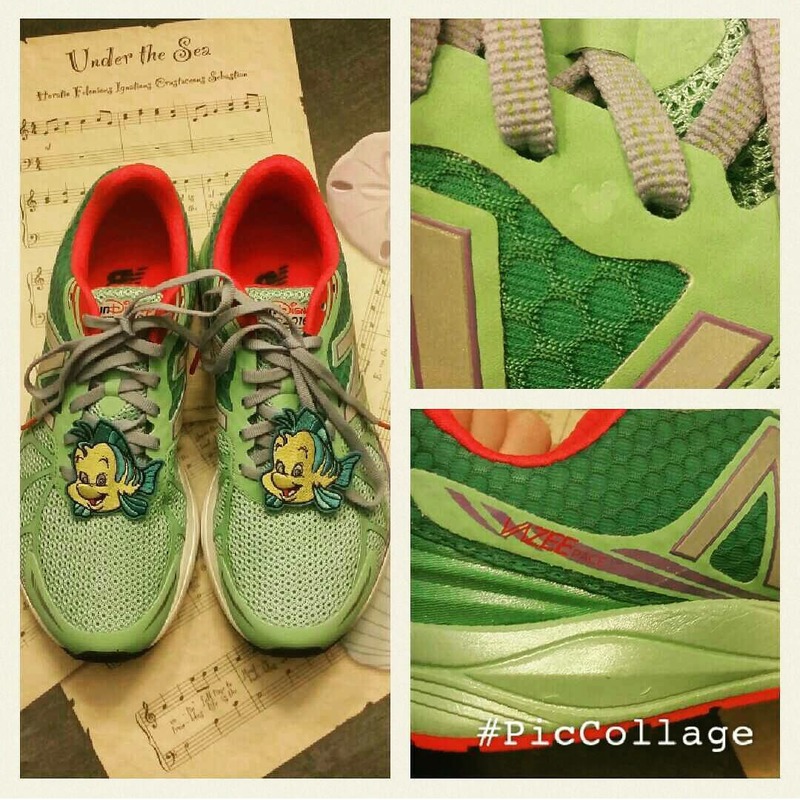 We chatted with the New Balance folks and we were able to get right in to try on the shoes we were both hoping to get- the Ariel Vazee Pace! Jen and I both bought a pair... and the extra Flounder clips- they were only $5! And then I got to meet Rudy Novotony! 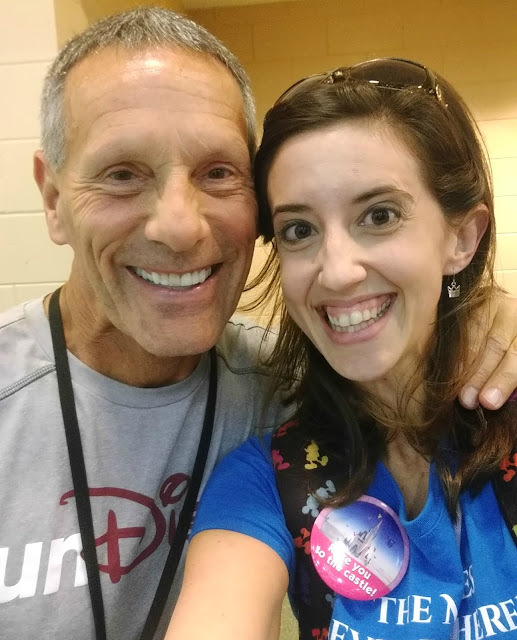 He is the race announcer for all the runDisney races and he was unbelievably sweet and kind to us. We grabbed a selfie and then he ran off to MC one of the expo speaker sessions. Could I be cheesin' any bigger?! We meandered through the rest of the expo looking for free samples and some of our favorites. 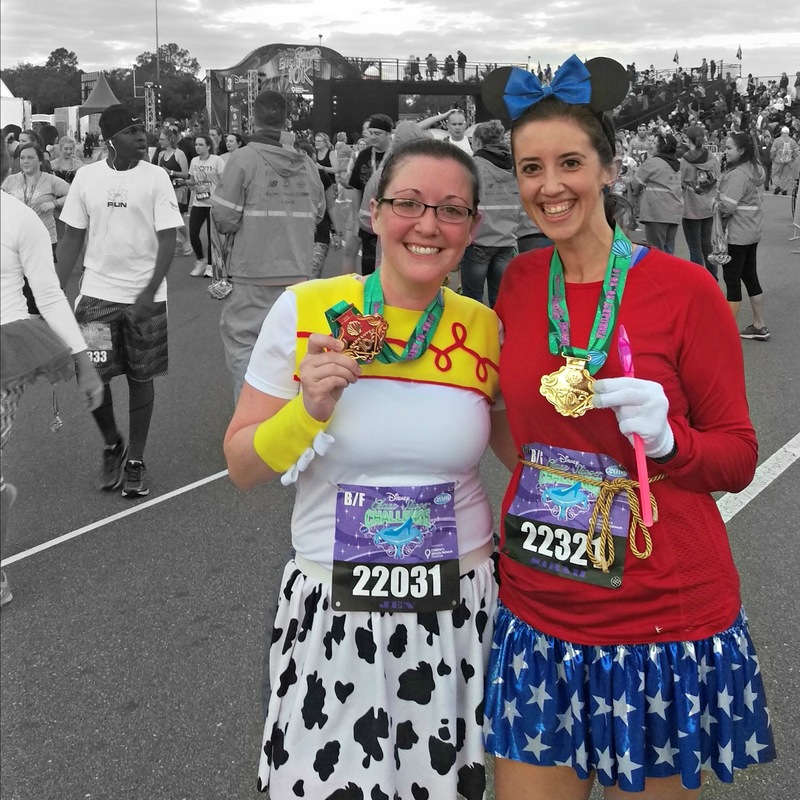 I ended up buying some crazy expensive Minnie Mouse KT tape but it was totally worth it since I would be Minnie Mouse for the half marathon. Around 5:30 pm we headed back to AoA to grab some dinner and get to bed early. We were planning on being on a bus by 3:45 the next morning! 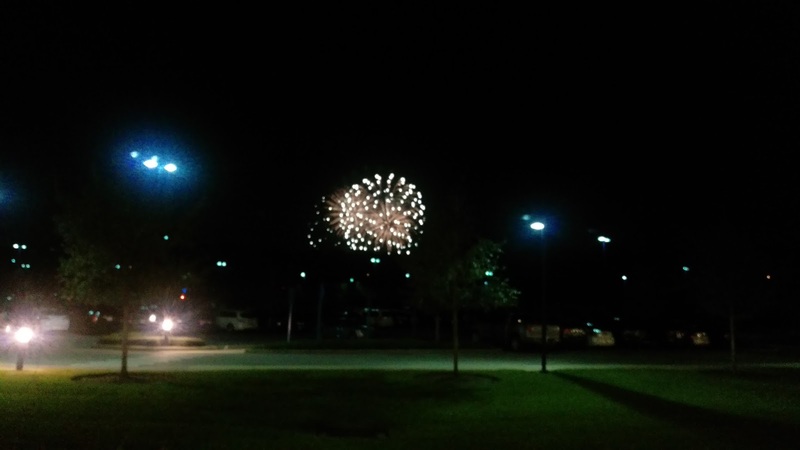 As we were getting ready for bed, we got a little surprise- fireworks. I think it may have been the new night show at Animal Kingdom but either way, we got a 15 minute show right outside our hotel door. Our own personal fireworks show! After all the squealing excitement while we watched the fireworks, we finally got into bed and got some sleep, After what felt like minutes, our 3 am alarm was going off and we were crawling out of bed, questioning our sanity for being awake this early. 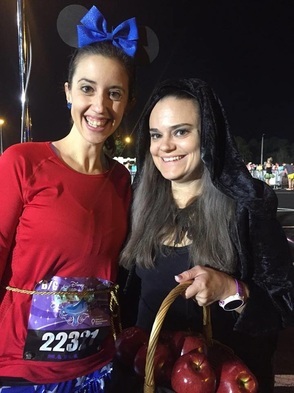 Luckily, we'd set out our costumes and running gear the night before so it was relatively painless getting dressed and out the door. We'd planned to meet up with some friends once we got to the Epcot parking lot and with some tweeting and facebooking, we finally met up with Justin and Brandi. Jessie and Sorcerer Mickey are ready to run! Photo credit: Justin. Crappy lighting credit: Epcot parking lot at 4 am. 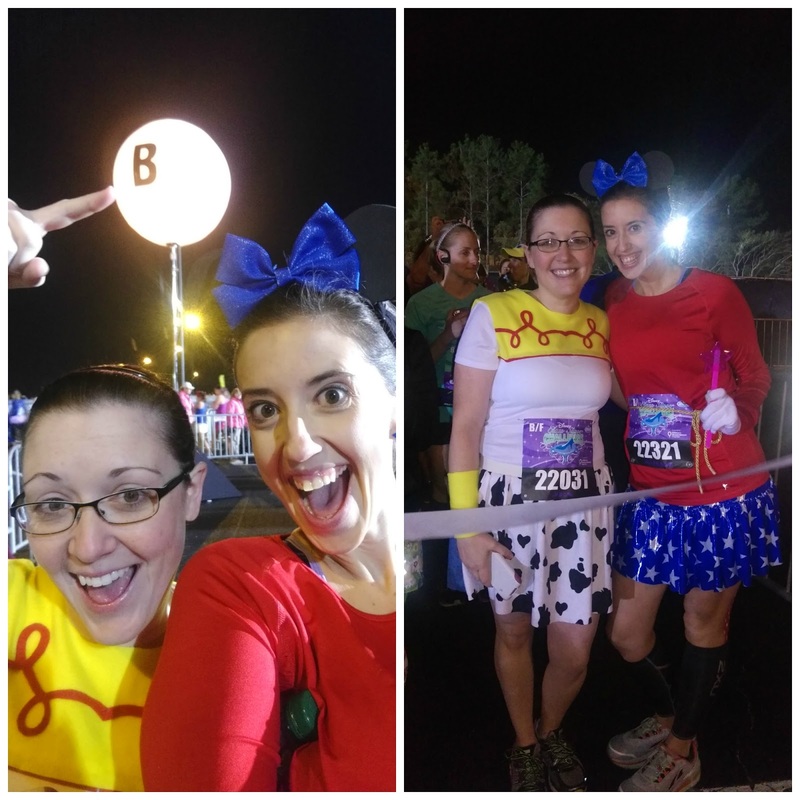 Eventually Jen and I made our way to our corral- B! I still don't know how we managed to be in the second corral but it was pretty awesome! We were able to make our way up to the very front of corral B and were underneath the starting line scaffolding as the fireworks went off for our start- it was awesome and super loud! Literally at the front of the tape for the start of corral B. We ran through the last little stretch of Epcot and then headed towards the finish line. We saw a guy with the best shirt ever- front: Does Prince Eric have a brother? back: Just trying to catch a prince like the rest of you! 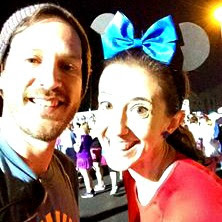 Then we slowed down at the finish (only at a runDisney event!) so we could have less people around us for a perfect finish line photo- ha! I think she liked the medal. Headed to Downtown Disney Disney Springs in style. Overall, I like this 10k course at WDW. 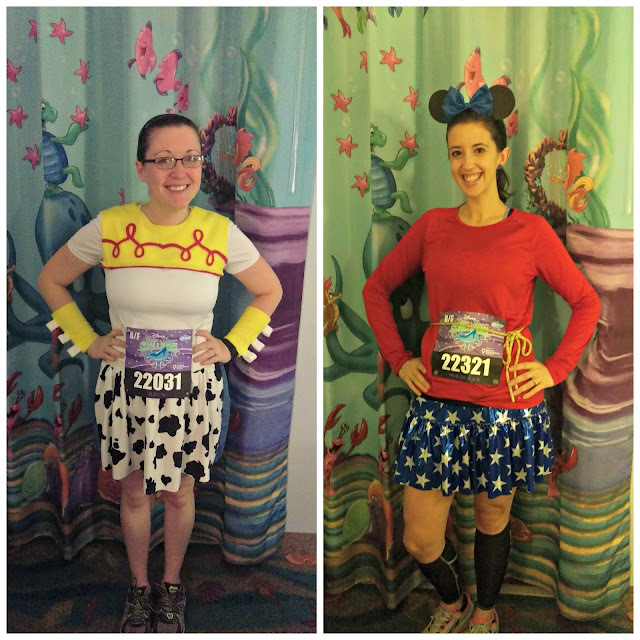 This is the third time I've run it (Dopey 2014, WDW 10k 2015, Princess 2016); they use the same course for each 10k at WDW. I do wish we spent more time in Epcot but there isn't much they can do with the size of the park. Starting in corral B was a completely different experience than starting in corral D during Dopey in 2014. The course wasn't ever really crowded and while many characters had lines, they weren't totally insane like they were in 2014. The amount of entertainment on the course was decent. I really enjoyed seeing the coral people- I don't think I've ever seen them before during a race or in the parks. Anyone know where you find them regularly? It was weird that Ariel or Sebastian weren't out; especially because this weekend was Little Mermaid-themed. I remember seeing the witch from Snow White, Cogsworth and Lumiere from Beauty and the Beast, and Princess Sophia (Disney Junior). I'm sure there were more but I can't seem to remember the ones we didn't get pictures of! All in all, we had a great time and I'm so glad we decided to do this race! Have you ever run a 10k at Walt Disney World? What did you think of the race? 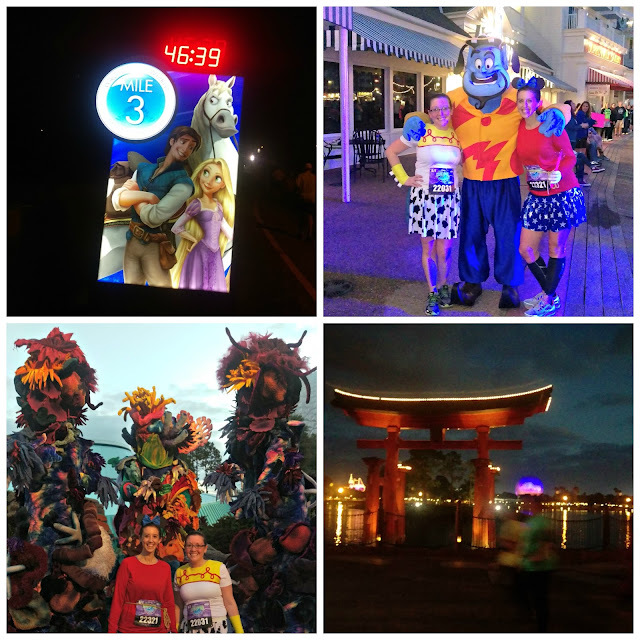 Stay tuned for the Part II recap of Princess Half Marathon Weekend: meet-ups, running ohana, and the half marathon! I'm heading to Cali for the Dumbo Double Dare and then the Wine & Dine! Hello! I'm so sorry we didn't connect in Disney! We will be back for Marathon Weekend 2017 :-) Enjoy both DDD and W&D- they are awesome races!